I had been walking without a break for the better part of two hours. With no particular destination in mind, I just kept roaming, occasionally checking in with my map to get an idea of where I was. Some people think the cupcake craze should end already. They say it’s last year’s trend. A trend period. Something cool till everyone does it and then it becomes overdone and out of fashion. I am not one of those people. I love cupcakes, always have and always will. Which is why when I saw a cutesy, baby blue truck selling cupcakes near Washington Square Park this weekend, I stopped to check it out. Cake & Shake is one of a billion different places in the city to get cupcakes but unlike some of the others it also boasted having organic ingredients and biodegradable, eco friendly packaging. The truck itself was even powered by solar powered panels. The menu sounded promosing enough and when I saw something with figs (which I have been eagerly anticipating lately) in it, I thought, yup, that’s the one. Name of this cupcake, you ask? A Rich Guy. Jokes aside, the Rich Guy wasn’t bad. It wasn’t fantastic either, but it was decent. The mandarin cupcake was a little hard for my taste but the fig mousse (which was more like jelly than mousse) gave it a bit of the moisture it lacked. 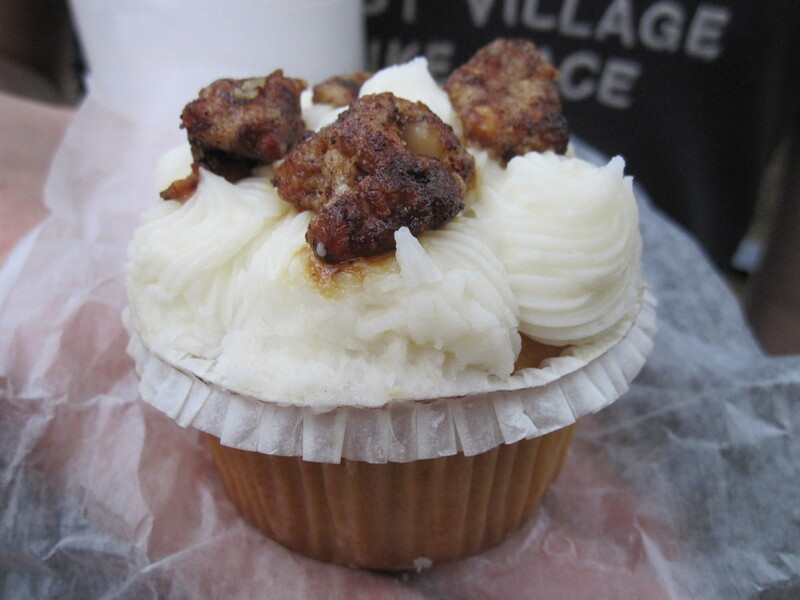 The cream cheese frosting and candied walnuts were pretty good too, although a overall little firm, like it wasn’t the freshest cupcake. In their own defense, it was early evening, toward the end of the day, and so probably not the best time to go looking for fresh cupcakes. But like I said, it was good. I’d go back and try a different one. After all, I’m all about propogating the cupcake craze. When I first read about Butch Bakery, a New York cupcake shop specializing in so-called manly cupcakes, I was pretty curious. 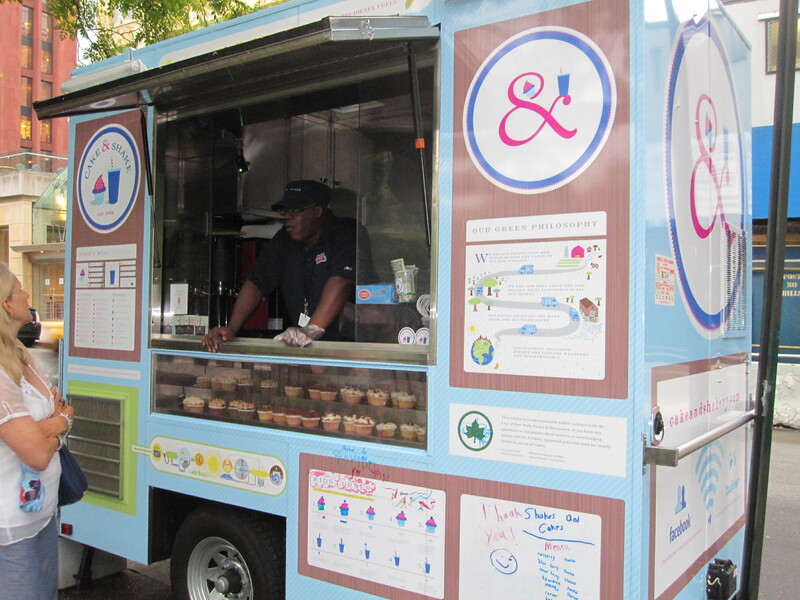 Their cupcakes, so proclaimed the website, weren’t what you’d call cute. No sprinkles. No pastel-colored frosting. Nothing girly. These were cupcakes for men. Tough men. Manly men. Men who eat cupcakes, dammit. Whaaaat?! Where is this place? I need one of these right now. Right. Freakin.’ NOW. I was fully prepared to take an early lunch break and go wherever it was that they were churning out these manly cupcakes but stopped myself when I read that they didn’t have an actual shop yet. Delivery only. 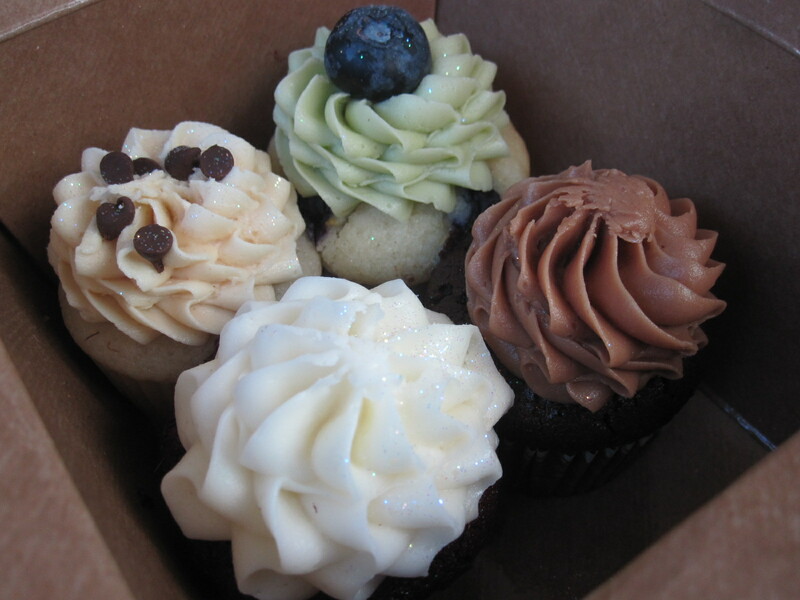 So, I whipped out my credit card and immediately ordered The Short Round, Butch Bakery’s assortment of four cupcakes. Unfortunately, the set comes with four flavors that aren’t substitutable and The Driller wasn’t one of them. But after reading about the cupcakes I’d soon be getting, I was ok with that. About a week after I put in the order (who receipt was signed “Butch it up, buttercup”) a gruff-voiced man delivered my manly cupcakes. Upon first inspection, they were just as funny as their names. Each one, instead of being covered in fluffy, sugary icing, was topped with a thin chocolate disk. Each disk had a “manly” pattern or design, woodgrain, houndstooth, checkers and my personal favorite, camo. The first one we had was the Old-Fashioned, which like the other three in the box, was named after an alcoholic drink and was fittingly infused with alcohol. 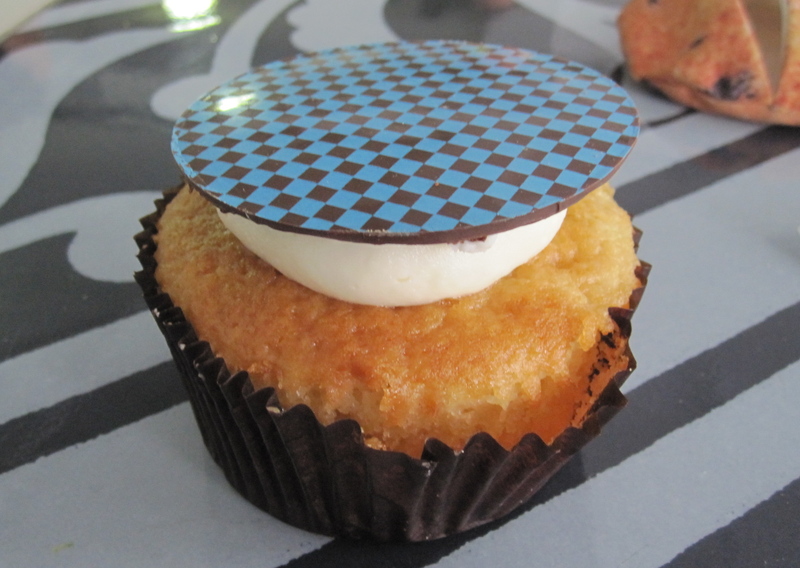 Underneath the checkerboard chocolate disk (which was crisp and tasty, a nice contrast to the softness of the cupcake below) was a fat dollop of sweet, sugary icing. The orange soaked whiskey cake was fluffy and moist, with just a subtle hint of alcohol. At the core of the Old-Fashioned was a zesty, creamy burst of flavor from the lemon curd filling. 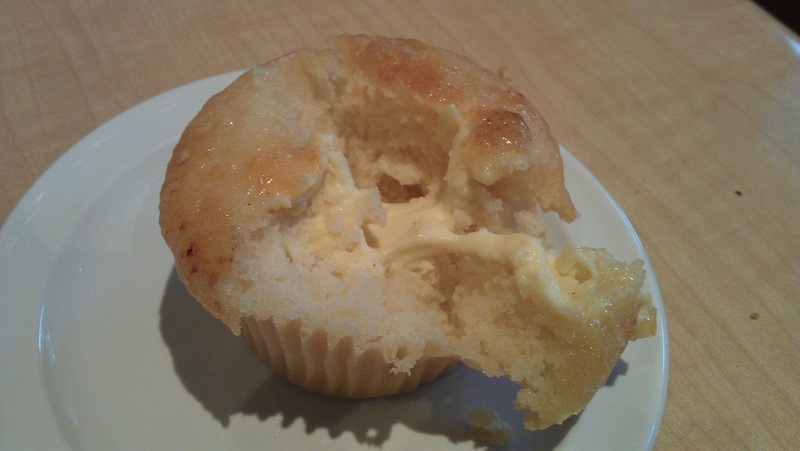 Next on our tour de cupcakes, was the brandy soaked lemon cake Sidecar. The orange-infused white chocolate filling in the middle was a smooth, creamy complement to the almost spicy zest of the brandy and lemon. Our third booze and testosterone inspired cupcake was the Rum and Coke. While I usually dislike the drink, the cupcake version was delicious. 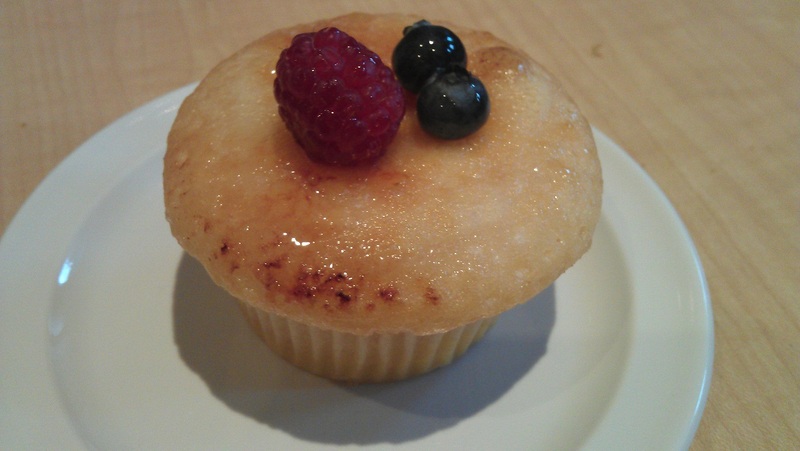 The rum soaked vanilla cake wasn’t overpowering like rum cake can sometimes be. Instead it was sweet with just a slight aftertaste of rum. 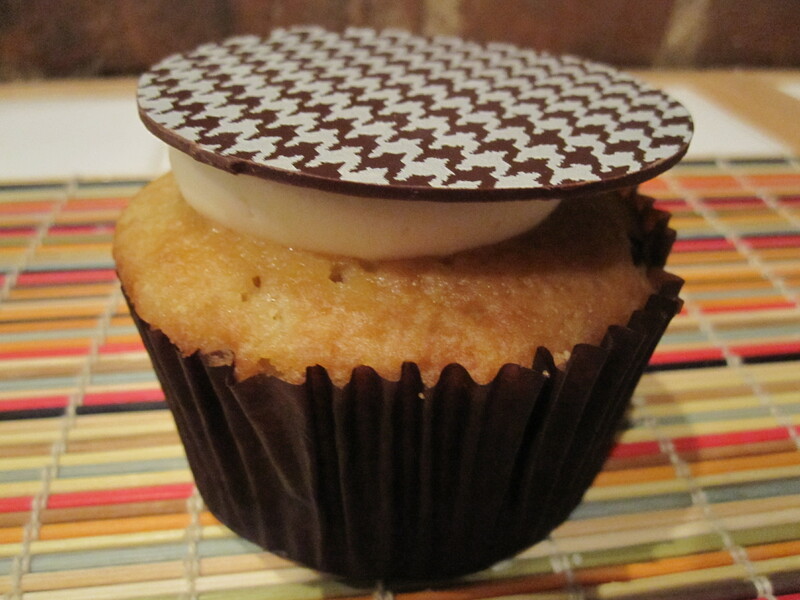 With the cola bavarian cream filling and a snap of the chocolate on top, each part of this cupcake worked together perfectly to make a delicious little treat. 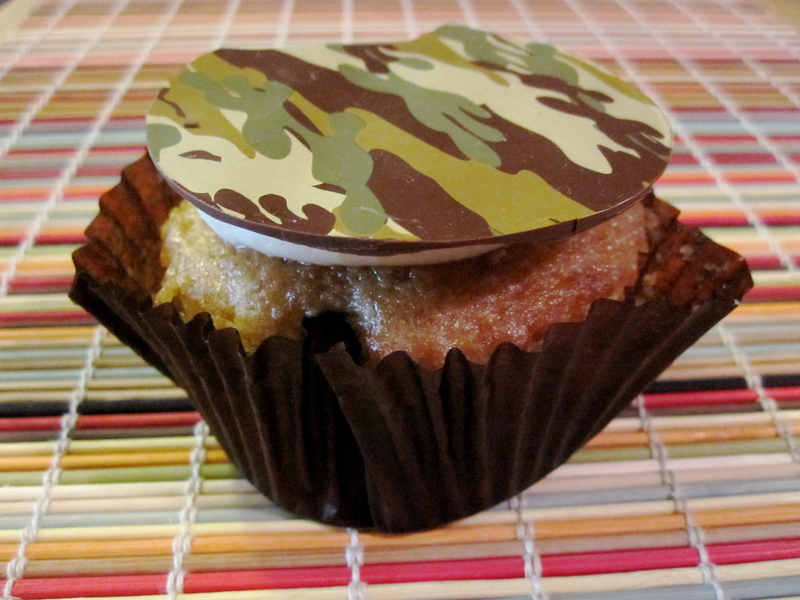 And finally, there was the B-52, a camo topped madagascar vanilla cupcake soaked in Kahlua, one of my favorite liquors. Like the others, the alcohol taste was very subtle and in the B-52 it merged perfectly with the vanilla. The sweet Bailey’s bavarian cream in the middle made for the perfect filling. In the end, these cupcakes might’ve been created by guys with guys in mind, but I’m pretty sure these’ll be a big hit with the female cupcake eaters too. Unlike some of the more girly varieties available around town, these weren’t over the top. The frosting was just enough to give you a little sweetness without making your teeth hurt, and the inside filling wasn’t messy or overbearing. No messy sprinkles, nuts or cookie bits, just an easy-to-eat, easy-to-share chocolate. When Butch Bakery opens its NYC shop, I bet I won’t be the only girl waiting in line to butch it up. 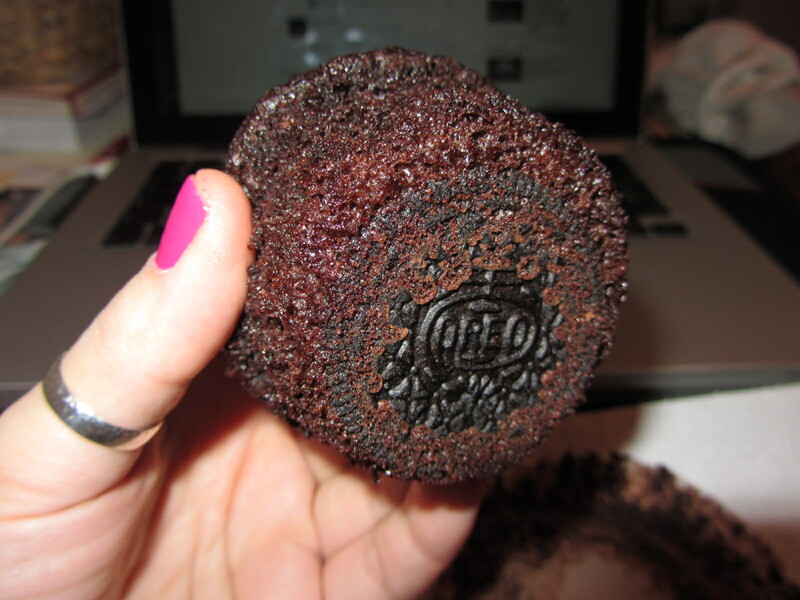 I didn’t think this day would come, but here it is: I have something negative (well kind of) to say about a cupcake. Yesterday was stressful. Deadlines were piling up, I had interviews to do, stories to write, personal issues to deal with, and to really kick everything up a notch, I’m in the middle of moving to a new apartment. (If you live in New York, you know what an immense, flaming pain in the arse this is.) So as I tried to work my way through everything, I realized I needed coffee to give me a much-needed boost, but since the office machine only had decaff (an entirely pointless drink) I decided to get some fresh air and a cup of joe elsewhere. 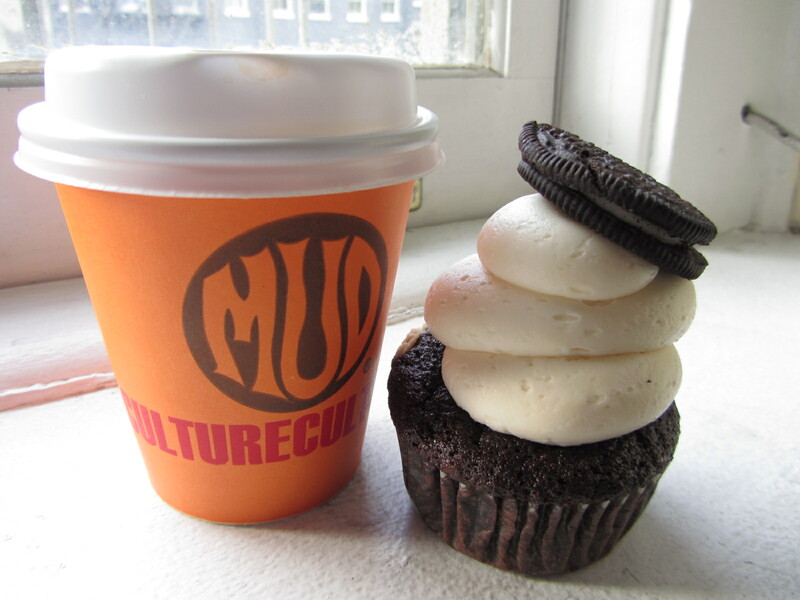 Once I was outside though, I thought, well hell, why don’t I just cut across Bryant Park and mosey on over to Crumbs where I can get a cupcake to go with my coffee. So I did, and as my eyes bounced around cookie-crumb covered, sprinkle crusted, coconut flake topped cupcakes, they finally landed on the dulce de leche cupcake. Minutes later, cupcake and coffee in hand, I hurriedly made my way back through the park and up to the office. Where's the dulce de leche?? 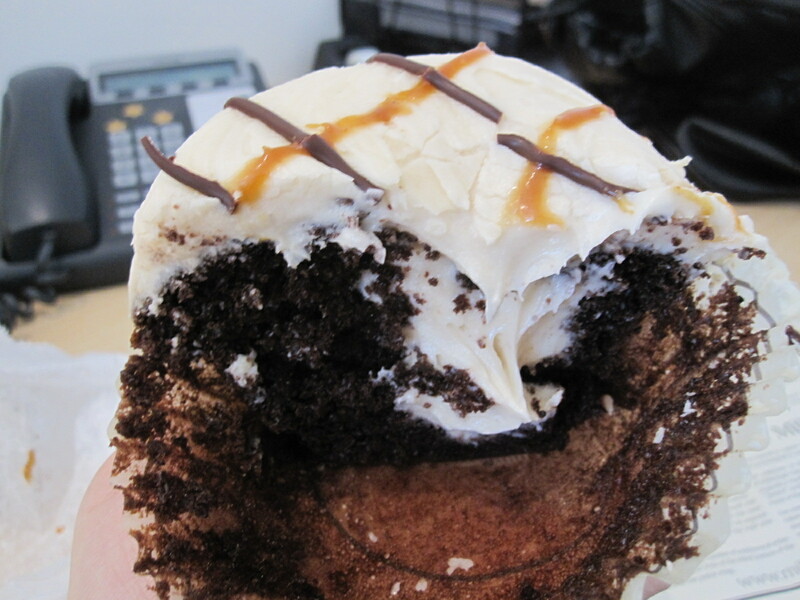 Yet when I cut the cupcake in half (I was trying to minimize the mess at my desk) there was no dulce de leche to be found. 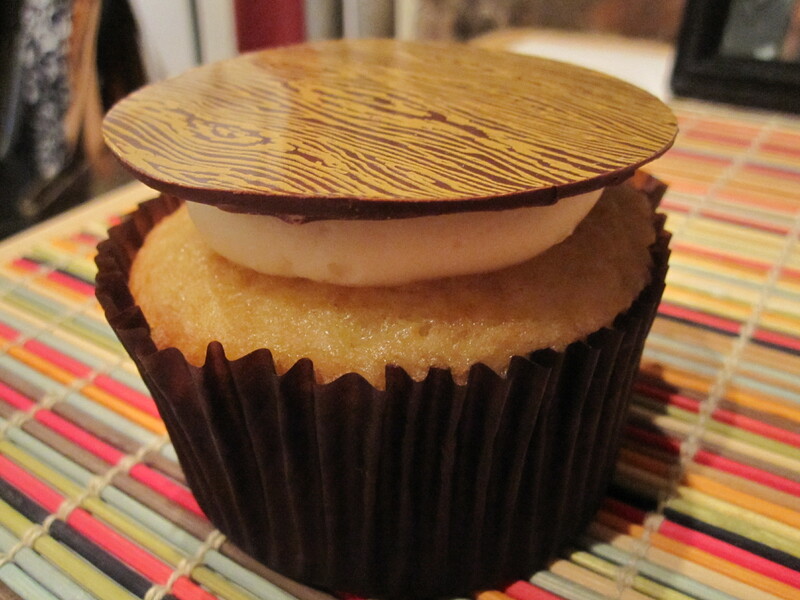 Instead, the chocolate cupcake had a cream cheese frosting core, the same as the icing on top. 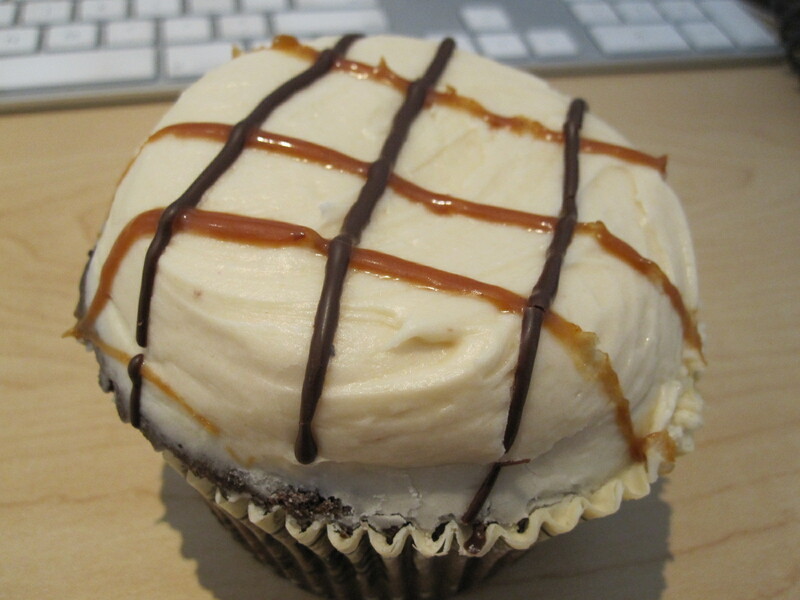 Now, don’t get me wrong, it was still delicious, and of course I polished it off in a few big chomps, but why call it a dulce de leche cupcake if the only dulce de leche is a couple of thin drizzles on top? Had I known this, I would’ve bought a different cupcake! There were so many others I thought about getting, yet what sold me on this was one was the promise of dulce de leche. Being April 1st, I thought it might have been an April Fool’s Day joke, but then that’s not even funny! ::Sigh:: You let me down this time, Crumbs.